Also serving communities of New Castle. The average cost of assisted living in Shelbyville is $2,512 per month. This is lower than the national median of $3,346. To help you with your search, browse the 7 reviews below for assisted living facilities in Shelbyville. On average, consumers rate assisted living in Shelbyville 4.4 out of 5 stars. Better rated regions include Frankfort with an average rating of 4.8 out of 5 stars. Shelbyville, located in north-central Kentucky, is home to more than 15,000 residents, including those seniors living in the area's 20 assisted living facilities (ALFs). Kentucky ALFs are controlled by the Kentucky Department for Aging and Independent Living and offer a secure community living environment as well as help with day-to-day tasks like grooming, eating and bathing. The Shelbyville, Kentucky area is home to world-class medical facilities including Kentucky One Health Jewish Hospital Shelbyville, in the event of medical emergencies or illness. The climate in Shelbyville is categorized on climate maps as humid, sub-tropical. That means the area experiences hot, humid summers, rainy springs and mild, cool winters. The average high temperature in Shelbyville in January is 40 degrees Fahrenheit and the average high temperature in July is 88 degrees Fahrenheit in July. This climate is generally agreeable for seniors, although the rainy periods may be difficult for those with arthritis and other joint and tendon issues. Shelbyville has an array of community resources for seniors, including Shelby Senior Services, an organization that offers meals, wellness programs and legal assistance to seniors age 60 and older, as well as a senior center. Shelbyville's overall crime rate is worse than most other towns in Kentucky. Even though it has decreased by seven percent in recent years, it is still 70 percent higher than the national average. Theft and property crimes are rampant here and can be a concern for older people and their families. Interstate 64 bisects Shelbyville and connects the city to Louisville and Lexington. While there is no fixed route public transportation in Shelbyville, seniors can find a ride with Louisville Wheels for medical appointments and trips to the senior center. Shelbyville is known for its picturesque and vibrant historic downtown shopping district. In addition, seniors in the area can get their dose of culture by visiting the annual Shelby Book Fest, the Shelby County Community Theater and the Shelbyville History Museum. Assisted Living costs in Shelbyville start around $2,512 per month on average, while the nationwide average cost of assisted living is $4,000 per month, according to the latest figures from Genworth’s Cost of Care Survey. It’s important to note that assisted living rates in Shelbyville and the surrounding suburbs can vary widely based on factors such as location, the level of care needed, apartment size and the types of amenities offered at each community. Supplemental Security Income Category G is available to Shelbyville seniors who need help covering the monthly costs of assisted living. Shelbyville and the surrounding area are home to numerous government agencies and non-profit organizations offering help for seniors searching for or currently residing in an assisted living community. These organizations can also provide assistance in a number of other eldercare services such as geriatric care management, elder law advice, estate planning, finding home care and health and wellness programs. To see a list of free assisted living resources in Shelbyville, please visit our Assisted Living in Kentucky page. 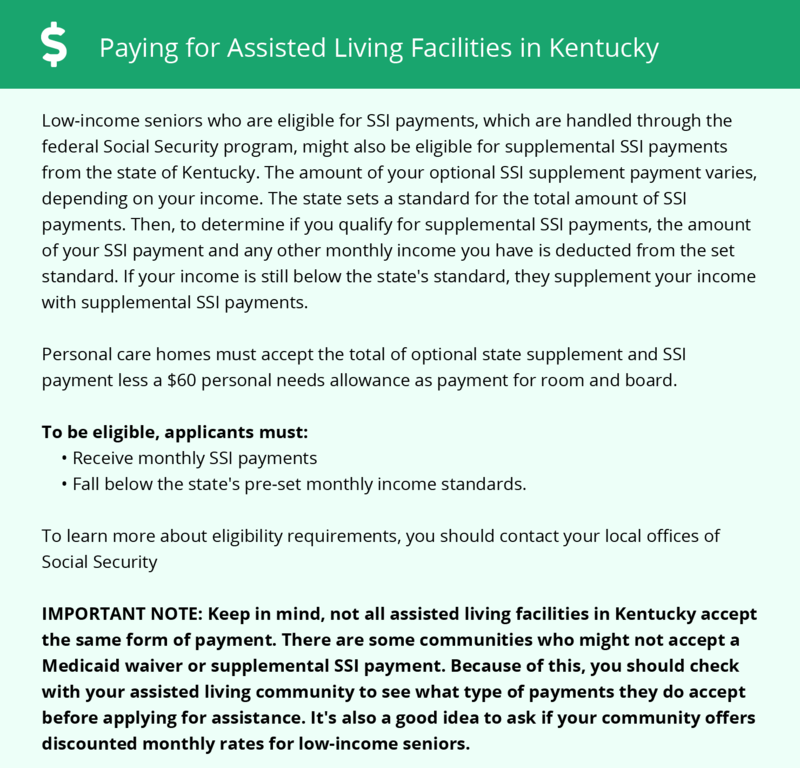 Shelbyville-area assisted living communities must adhere to the comprehensive set of state laws and regulations that all assisted living communities in Kentucky are required to follow. Visit our Assisted Living in Kentucky page for more information about these laws.